“These harsh conditions we are facing are going to be with us for some time so we need to be resilient,” ERAA President and boss of Brit Air, Marc Lamiday introducing the association’s AGM at Dublin. For today’s 57 ERAA airline members, financial issues are now their biggest priority, so to this end the ERA Board announced plans to introduce a new working group of CFOs who will be tasked with sharing best practices on financial issues. 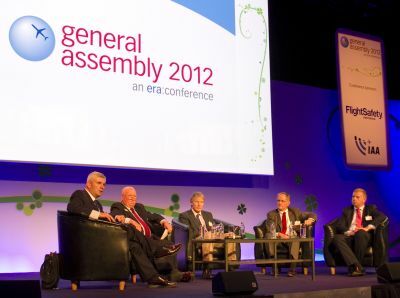 “We are now into our fifth year of economic problems,” echoed the organisations outgoing Director General Mike Ambrose. 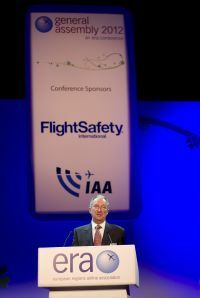 “The whole industry is facing severe financial constraints, yet little is being done to slow the pace of further regulatory burdens or to promote the development of air transport. There is no end in sight to the Eurozone debt crisis, the forthcoming election is fuelling uncertainty in the USA and there has been sudden and significant increases in user charges and taxation in EU states. Government action in loading air transport with additional taxes and charges is comparable with demanding that someone suffering from anaemia should become a blood donor,” he stated. According to latest statistics for the first six months of 2012 compared with the first half of 2011, ERAAs airlines reduced their capacity considerably this year down - 9.3% in terms of ASKs and -6.4% in terms of seats. Passenger growth was down - 2.9%, passenger growth kms down -5.4 % and seat growth -6.4%. The airlines are feeling the need to restructure, consolidate and identify new opportunities. Air France is poised to put a new make-up together for its regional airline partners - Brit Air, Regional and Airlinair - under one new entity, CityJet Air France is ‘looking for new investors’ and newly independent bmi regional and Finland’s blue1 were at ERAA talking up interest in offering wet lease and ACMI contracts to complement scheduled flying. State aid is an ongoing concern for Europe’s regionals. ERAA challenges that aid given locally by airports to particular carriers (especially LCCs) in the form of ‘marketing support’ represents significant distortion, which is contrary to that level playing field which ERA has been fighting for its whole existence. ERAA’s Board has called on a stronger enforcement of EC rules and greater transparency in the setting of charges. It reported some success in overturning a proposal on new rules regarding slot allocation. The original EC consultants’ study recommended that the introduction of primary trading would bring about new capacity at airports. ERAA, together with business aviation association EBAA argued that the study took no account of the potential effects on Europe’s regions, airlines and OEMs, where only those with the deepest pockets would benefit. Following the preparation of their own independent parallel report (prepared by Mott Macdonald) the primary trading recommendation has been dropped. 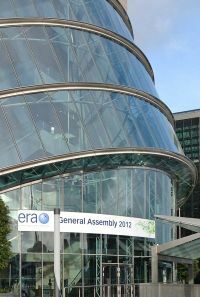 Dublin and its striking new convention centre on the banks of the River Liffey proved a popular venue for ERAA 2012. I travelled courtesy of CityJet from London City Airport. From a passenger’s perspective, it is hard to fault the sleek City Airport experience, even though the terminal has expanded so much in 25 years you wonder where it can possibly accommodate any more passengers in its busy lounges. You can literally work right up to boarding with power sockets and free wifi everywhere airside. On both legs our flights arrived early. Estonian Air is the latest to declare its move to the airport and it will give up Gatwick-Tallinn in favour of LCY in March 2013, coinciding with delivery of its first Embraer 190. CEO Tero Taskila cited passenger preference and the ability to shave 20 minutes off the journey time and 30 minutes off the turnaround time. CityJet, which marks its 20th birthday next year, will open a new route to Munster Osnabruck in Germany from London City on October 29th with morning and evening flights - its 19th destination. 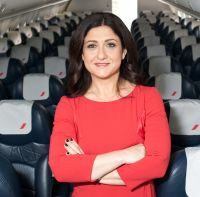 At ERAA it was announced that its CEO Christine Ourmieres, a long time Air France executive, will join the ERAA Board. The company’s biggest asset is its slots at LCY, she said, confirming Air France’s wish to attract new investors into the company. The majority of CityJet’s routes are secondary to secondary routes which mean the company has a strong market niche (many of these picked up following Air France’s acquisition of VLM in 2009 with its 13 Fokker 50s joining CityJet’s 22 Avro RJ85s.) There are also opportunities for regional connections. London City Airport is essentially a business airport with 95% of its passengers flying point to point. There are destinations that do make sense says LCY Sales Director Bernard Lavelle e.g Isle of Man to Zurich (or Bern with SkyWork), but the airport doesn’t encourage the use of London City for long haul connections through the big hubs as it would impact on it ability for quick processing. Estonian Air took the Silver accolade in this year’s airline awards for its solid business performance and its work creating an evolving new network business model. Wideroe of Norway, last year’s Silver winner, took the Gold, but the most popular win of the night belonged to Bronze winner CEO Magni Arge at Atlantic Airways of the Faroe Islands, a first time recipient, widely acclaimed for his airline’s work in pioneering a new RNP AR navigation system for its Airbus A319 serving Vagar Airport. Newly independent under new management bmi regional, headquartered at East Midlands, UK, was introduced at ERAA as a new airline member. Executive chairman Ian Woodley reflected that if its predecessor company, Scotland’s Business Air (which he founded with Graeme Ross) had still been in business today, it would be marking its 25th year. (BT News last week). C-Series for the low fare carriers? At a press briefing updating progress on the C Series, Bombardier Aerospace VP Marketing Philippe Poutissou said that the CS100 is on track to enter service by the end of 2013, followed by the larger CS300 one year later. He fielded questions about the possibility of a high density -class S300 following interest in a 166-seat version from Vueling and Air Asia. Poutissou acknowledged increasing customer interest in such a variant, and it was something the Bombardier Board had to make a decision on. This could be as early as October. This year’s Gala dinner and awards was a special one for Mike Ambrose where past ERAA airline bosses including Hans-Rudolf Wohrl, Brad Burgess, Andre Dose, Antonis Simigdalas and Fritz Feitl joined ERAA Honorary Chairman Moritz Suter to pay their tributes to the man who has contributed so much to the Association, taking it from nothing to the strong, influential association it is today. “Thank you Mike from the bottom of my heart, “ said Moritz, the founding father of ERAA. He recalled the organisation started out as a club of friends who were facing great battles with the monopolists to grow their companies. Tyrolean, Crossair, Brit Air, NFD, Air UK were among the first members.